NEWPORT, RI -- The International Tennis Hall of Fame has announced that Todd S. Ellenbecker of Scottsdale, Arizona, Sharon Rosenburgh of Indianapolis, Indiana and Kathleen Ann Stroia of St. Petersburg, Florida are the 2007 recipients of the Tennis Educational Merit Awards. 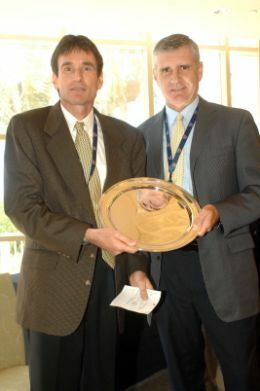 These prominent tennis awards were presented in late April at a special luncheon held in the Vista Ballroom of the Naples Grande Beach Resort in Naples, Florida, during the United States Tennis Association (USTA) Annual Meeting. Todd S. Ellenbecker has volunteered his time for over 20 years to organizations such as the USTA, the United States Professional Tennis Association (USPTA), the International Tennis Federation (ITF), and the ATP (men’s) and WTA (women’s) tours. Ellenbecker has been the Director of Medical Services for the ATP Tour since 2007 and has been the Chairman of the Sports Science Committee for the USTA since 2003, first joining the committee in 1989. A lifetime member of the USTA, Ellenbecker is also an Honorary International Member of the British Tennis Coaches Association (2006-present). He has written a significant number of books on tennis and has contributed to more than 29 research publications. He is an avid and entertaining public speaker in his field and has presented at numerous conferences worldwide. As a Sports Clinical Specialist and Orthopaedic Clinical Specialist, he runs his own sports clinic in Scottsdale, AZ. When not in residence at his clinic, Ellenbecker is a faculty member at the Rocky Mountain University of Health Professions and the University of Wisconsin-LaCrosse. He is also a consultant for the Arizona State University Men’s Tennis Team, the Milwaukee Brewers Baseball Club, and the Theraband Research Advisory Committee. In the past Ellenbecker was a consultant for the San Francisco Giants and the Oakland Athletics Baseball Clubs. Known internationally for his research, writing and clinical teaching, Ellenbecker is clearly one of the top specialists in his field.